Apart from being highly decorative items, spindles on a staircase also provide an essential safety barrier, preventing accidental falls especially for children. 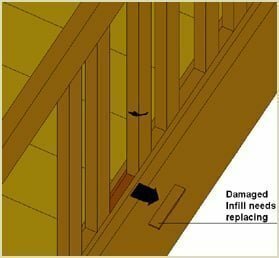 So, when a spindle is damaged in any way, it is essential that it is replaced as soon as possible. Not just for aesthetic reasons, but for safety issues also. Replacement of a broken spindle on a closed string is slightly different to that of an open string. Replacing Spindles - Closed String Staircase. 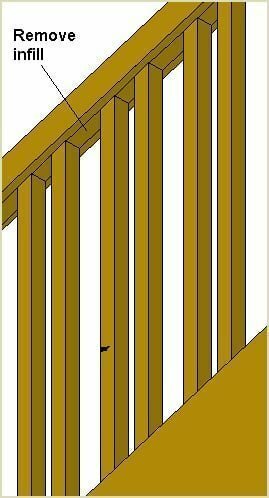 In a closed string staircase, the spindles are housed as below using wooden infills between each spindle, securing them by stopping them moving and hence being lifted out. To remove the damaged spindle, it is necessary to remove one of these fillets nearest the spindle. Carefully, using a very sharp, very thin chisel, chisel out the infill which is one down from the damaged spindle (as shown below). Take care not to damage the surrounding string. With the fillet removed, the next step is to do the same with the top of the spindle, which should also be housed in the handrail using the same fillet wedge system as the strings. Carefully chisel out the infill closest to the damaged spindle, again using a sharp, thin chisel, making sure not to damage the surrounding handrail. The damaged spindle should now be free to remove from the staircase. If the spindle is secured using nails or screws into the strings and handrail, then these obviously need to be removed. Here at Pear Stairs we have a spindle matching service which we call “copy turned spindles”. We can reproduce any type of design spindle with any type of wood. You can send us a photograph to our email service, with rough dimensions (diameter, length, type of wood) at websales@pearstairs.co.uk. We will in turn send you a quotation. Should you accept please send your broken spindle(s) and we can send replacement(s) out to you within 2 working weeks. 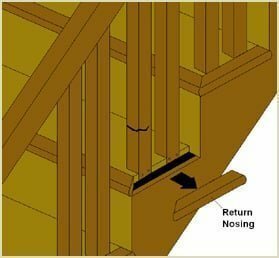 Once you have received your replacement spindle(s) and infill(s) you can go about refitting the spindle into your staircase. 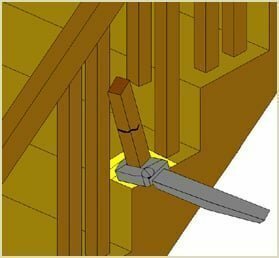 Firstly, you will need to cut the top and bottom of the spindle at the same angle of slope (or pitch) as your staircase. To do this, if you have your old damaged spindle to hand, simply copy the cut angle onto the new spindle. If you don't have your old spindle, use a T-bevel to measure the angle of the handrail and string (which should be the same), then use a mitre box to cut the spindle. Once the spindle has been prepared, slide it back into position on the baserail of the string and back into the base of the handrail. 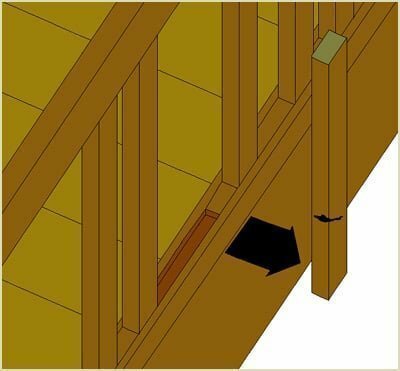 Make sure it butts up tightly against the infills in place on the handrail and base rail. Now replace the missing infill strips on the baserail and handrail. They will need to be cut to size and mitred accordingly, so take measurements carefully. Use woodglue or even small wood pins to secure them in place on the handrail and baserail. There should be a tight fit between the spindle and infill strips so as not to allow any movement of the spindle and hence stop it from working loose over time. Finally, the new spindle should be in place and secured in the staircase. 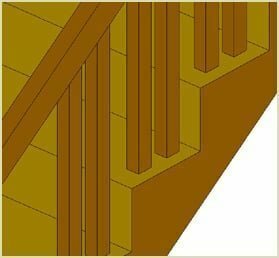 Based upon how the staircase is painted or stained, the spindle and infill strips will also need to match the appearance of the rest of your staircase. Replacing Spindles - Cut String Staircase. 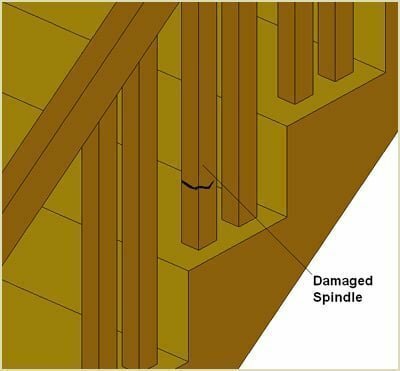 Below is a brief guide on how to replace a broken spindle from a cut string staircase. 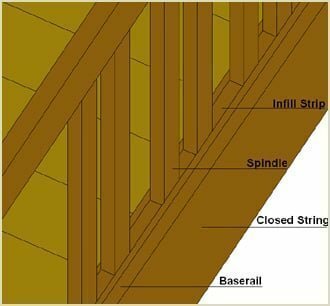 Firstly, you need to determine the method in which your spindle is joined to the stair tread. 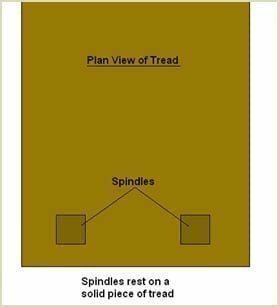 If the base of the spindle rests on a solid section of tread, it should have a rounded dowel end that is glued into a hole in the tread. For the next stage, we are going to concentrate on replacing a spindle with a rounded dowel end that is fixed into a solid tread. This is by far the more complicated method of removing a spindle. Firstly, the spindle needs to be cut in two using a hand saw. 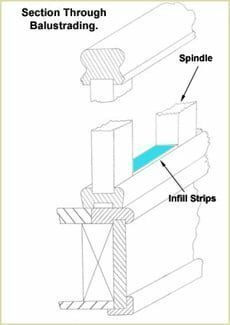 Be sure to cut the spindle through a plain section, leaving intact any special details you'll need to replicate the spindle. Cut through the spindle again at an angle so that a slice can be taken out of the spindle, to enable the spindle to be removed. At the base of the spindle, protect the surrounding tread with some masking tape before using a medium sized wrench to twist the spindle to free the dowel joint. 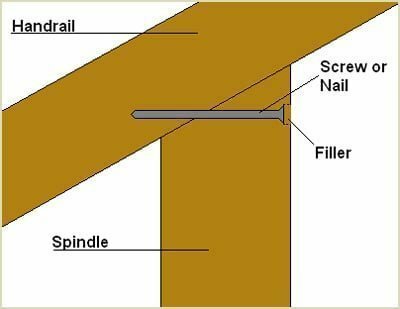 Carefully detach the top half of the spindle from the handrail, and scrape any old glue out of the dowel hole in the railing. 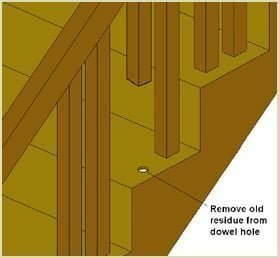 If the dowel breaks off in the hole, you will need to redrill the hole in the tread and use a new dowel to be able to fix the spindle on the tread. We can reproduce any type of design spindle with any type of wood. You can send us a photograph to our email service, with rough dimensions (diameter, length, type of wood) at websales@pearstairs.co.uk. We will in turn send you a quotation. Should you accept please send your broken spindle(s) and we can send replacement(s) out to you within 2 working weeks. 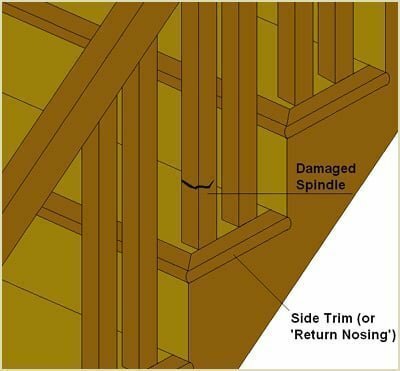 When you have your new spindle replacement, you will need to cut the top of it to the same angle as the slope (or pitch) of the handrail. Use the old spindle to get this angle, or if that isn't available, use a T-bevel and a mitre box to cut the angle straight. Either screw or nail the top of the spindle to the handrail and secure the base of the spindle to the tread. 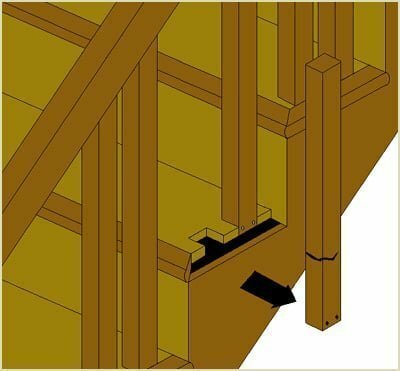 Square Tenon or Dovetail Spindle. 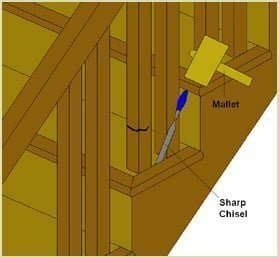 If on the other hand, the spindle base rests on a tread with a trim on the side, then it is most likely secured into the tread with a square tenon or dovetail joint.Square Tenon or Dovetail Spindle. Firstly remove the side trim (sometimes referred to as "return nosing") from the tread. 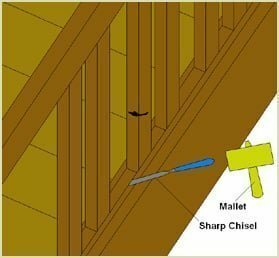 Remove the trim from the side of the tread by carefully using a sharp chisel and mallet to carefully pry off the tread, taking care not to damage the trim or the tread. 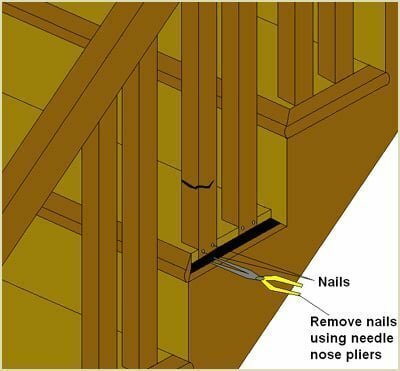 The spindle should now be exposed and you can remove the nails by using needle nose pliers and any adhesion can be broken by slowly edging the spindle out with a mallet. Extra care needs to be taken in removing the top of the spindle from the handrail. It would also most likely be attached to the handrail with nails and glue. Some light taps with a hammer should free the joint. 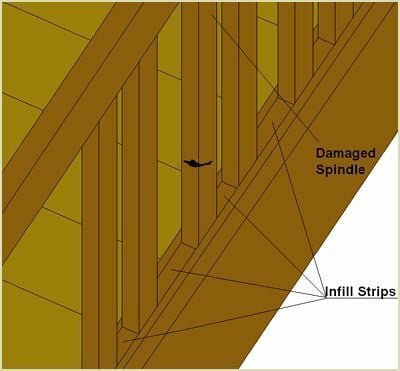 Once that joint has been broken, the spindle can be successfully removed from the staircase. 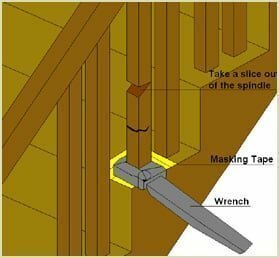 When you have your new spindle replacement, you will need to cut the top of it to the same angle as the slope (or pitch) of the handrail. Use the old spindle to get this angle, or if that isn't available, use a T-bevel and a mitre box to cut the angle straight. Either screw or nail the top of the spindle to the handrail and secure the base of the spindle to the tread. 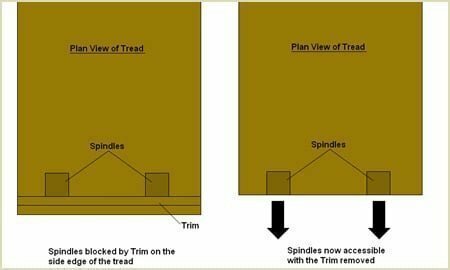 Replace the trim at the side of the tread and secure with nails and glue. Finally, the new spindle should be in place and secured in the staircase. 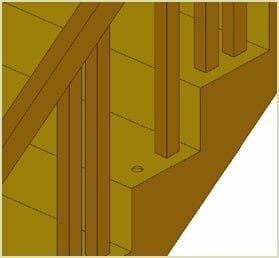 Based upon how the staircase is painted or stained, the spindle and infill strips will also need to match the appearance of the rest of your staircase. Remember if you have any questions don't hesitate to phone us about your staircase finish. We are a friendly company, phone 01938 553311.